Kids today want iPods, video games and all sorts of entertaining electronics. Apparently the 70s were considerably more boring if this vintage commercial is any indication. 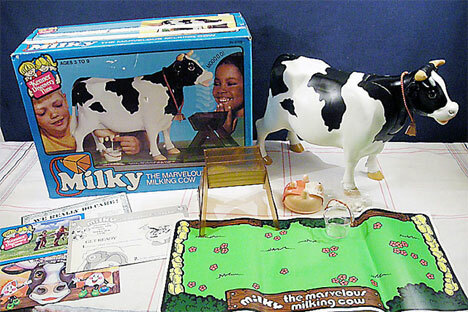 Milky the Marvelous Milking Cow was a plastic cow toy from 1978 that “drank” water and produced fake milk with the help of special tablets in her stomach. Kids dunked the cow’s head in water, squeezed its tail, then coaxed “pretend milk” out of the rubber udders…then, since it wasn’t real milk, presumably dumped it down the drain. The toy is not only terrible – it’s confusing. What kind of kid, other than one living on the wild frontier, would find milking a plastic cow interesting in any way? The toy wasn’t around for long, and it’s easy to see why. Now, thanks to Milk’s rarity and udderly ridiculous concept, the creepy faux bovine has become a collector’s item for toy enthusiasts. Interestingly, Milky was produced by Kenner Toys, the same company that made the original Star Wars figures. We’re guessing the Star Wars endeavor was a little more successful than the Milky franchise.